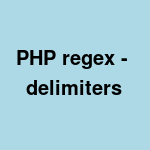 PHP requires regex patterns to have valid delimiters around it. Some languages may not require delimiters (e.g. python). To make code more readable, sometimes we want to use different delimiters. This article will list some commonly used delimiters. Since brackets are frequently used in regular expressions, using other delimiters makes code more readable. I prefer using slash or hash.